The biological narrative works "BIOLOGICAL NARRATIVE #7: DANAUS" and "CRYPTO:MINDO" will be shown at FILE HIPERSONICA 2007 at Sesi Paulista, Sao, Paulo, Brazil, August 14-17, 2007. “Biological Narrative #7: Danaus” is a digital video and biological/genetic music hybrid whose platform is built upon electronic translations derived from the locative protein complex of the migratory North American Monarch Butterfly. The work is based in the genotypic origins of this navigation in combination with the phenotypic expression that is exerted to fulfill this annual journey across the North American continent from Canada to Mexico and back. This protein-based sun compass translates the lifeform’s relationship to color wavelength, as well as terrestrial and biological time. The work builds on the sonic equivalents of these locative proteins, developing a multi-layered audio score derived from genetic sequences of the blue, ultraviolet, and long wavelength opsin proteins found in the vision system of Danaus plexipus. This sonic work is joined with the visual characterizations of this migration consisting of video field recordings, time-lapse documentation of the organism’s migratory path, and virtual reality of the butterfly’s microscopic anatomy. The resulting work bends the sensibilities of the Danaus specie across multiple data scales to re-mediate the essential ties that all organisms have to journey, vulnerability and survival. The audio work, CRYPTO:MINDO is an assembled electronic audio translation derived from the genotypic sources and phenotypic expressions that become intertwined in the exchange between human psychogeography and ecological retreat and encroachment. 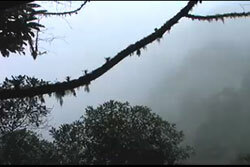 The ambient soundings of the work are based on bioacoustic field recordings from the occidental clouds forests of the Ecuadorian Andes, a biodiverse area which is currently challenged by human-induced deforestation, and ecosystem stability linked to global climate change and the decline of the tropical glaciers that feed the bioregion. The phenotypic aural expressions in this work are characteristic of territoriality, navigation and survival messages passed between the avian species of these high altitude cloud forest. Oscillating, interrupting and mixing into this bioacoustic ambient are the human genotypic and proteomic origins of the work. These sonic translations are derived from the human locative proteins cryptochrome 1 and 2 which are the biomolecular roots of human psychogeographic remappings, explorations, settlement and ecological encroachment that have persisted through human history. In the translation of protein sequence to audio equivalents, attention was given to the affinity that the molecules have for water - the crucial resource which also brings uniqueness and survival to the neotropical cloud forests. The resulting work is a polyphonic mix which bends the genotypic and phenotypic expressions of these intersecting species across multiple data scales to re-mediate the essential ties that all organisms have to navigation, habitat, vulnerability and survival..